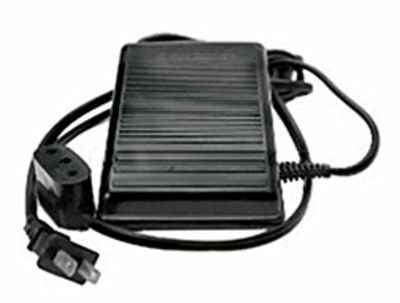 This foot controller (sometimes called a foot pedal) is the complete unit for the Singer Featherweight 221, and 301 -- just plug it in and begin sewing! This style is a step-up from most in that it is “Electronic” and will not heat up, even with long hours of continuous sewing. Some generic styles often seen (which we no longer carry) still contain fragile carbon disks. These carbon disks can break during shipping or if dropped, renders the foot controller useless. Another benefit to this Electronic new foot controller is that it has a wider foot base for easier speed control. The length of the cord from the plug that goes into the machine to the actual foot controller unit is 55 inches. This controller is suited for 110 volt electricity (North America) and the plug has the three round-pin holes (like most all 221 machines require). Most 222K machines, however, require a plug to suit the three flat pins on their machine receptacle. Therefore, if you have a 222K free-arm Featherweight, this controller will only work on your 222K if it uses 110 volt electricity and if it has been suited with the more common round 3-pin terminal receptacle.